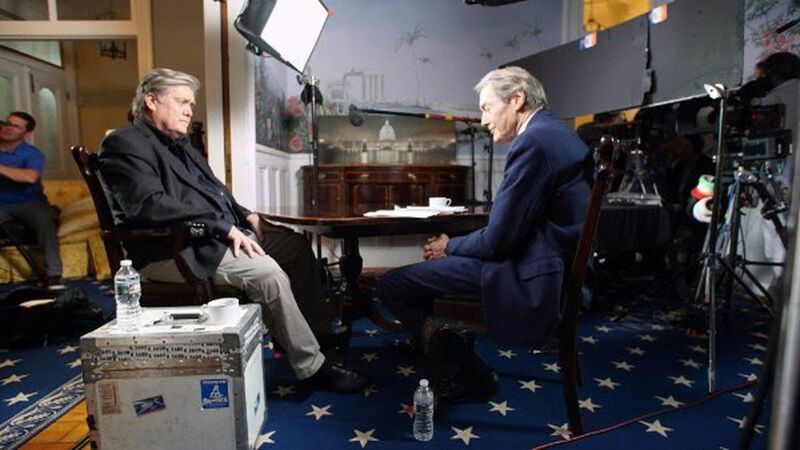 In his first interview since leaving the White House, Steve Bannon told CBS News' Charlie Rose "the Catholic Church has been terrible about" the DACA decision, called himself a "street fighter" and said Gary Cohn "absolutely" should have resigned. "The bishops have been terrible about this. By the way, you know why? You know why? Because unable to really – to – to – to come to grips with the problems in the church, they need illegal aliens, they need illegal aliens to fill the churches. That's – it's obvious on the face of it. That's what – the entire Catholic bishops condemn him. ... They have – they have an economic interest. They have an economic interest in unlimited immigration, unlimited illegal immigration... As much as I respect Cardinal Dolan and the bishops on doctrine, this is not doctrine. This is not doctrine at all. I totally respect the pope and I totally respect the Catholic bishops and cardinals on doctrine. This is not about doctrine. This is about the sovereignty of a nation. And in that regard, they're just another guy with an opinion." Watch the full interview on CBS's 60 Minutes this Sunday at 7 p.m.
On media: "The media image I think is pretty accurate. I'm a street fighter.... And by the way, I think that's why Donald Trump an I get along so well. I'm going to be his wing man outside for the entire time..."
Trump's Charlottesville speech: "My problem, and I told General Kelly this, when you side with a man, you side with him. I was proud to come out and try to defend President Trump in the media that day."